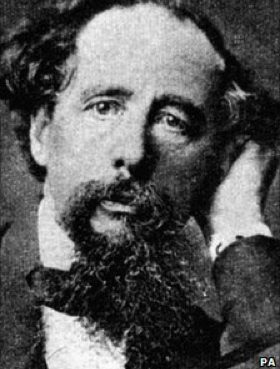 This week marks the 200th birthday of Charles Dickens. Just about everyone knows the name, even if they may have never read his work. We were introduced to his books in school, and some of us retain a life long attachment to them. Who, when reading those books, has not shed a tear at the story of Little Dorrit or Oliver Twist or been at once saddened and enchanted by A Christmas Carol? Disney may have made A Christmas Carol, his own but the original story lives on. These gems, Pickwick Papers, Great Expectations – all are favourites of mine. There was of course, more to the man than just his literary successes but we can only know him now through the pages of his letters, memoirs and biographies. Dickens’ 200th birthday has been marked universally but with even greater fervor and celebration in Portsmouth where he was born. Living not many miles from Portsmouth, I watched the spectacle with interest as it was aired on the local television news. Dickens’ Great, Great Grandson, Ian Dickens, was speaking on behalf of the now ever-expanding Dickens family. Charles Dickens had 10 children of his own to start the DNA rolling of course. As I watched the celebrations, I had the strangest feeling that I would have liked to have been there too. After all, one of the greatest stories passed down to me, comes from my own Great, Great Grandfather, John Faulder. According to my most reliable of sources, my Grandfather, Charles Dickens frequently took tea with my Great, Great Grandfather, John Faulder. John Faulder was not, so far as I am aware, a writer. Indeed, research shows him to have been a jeweller though perhaps he wrote in his spare time. “Your Great, Great Grandfather used to often have tea with Charles Dickens at his house in London.” There was undoubtedly, more in the way of padding for this tale but I confess to only having remembered that vital part. I do not know if this ‘taking of tea” was carried out in Dickens’ home as it was told to me, but I fancy, that it could have taken place in one or more of the many London tea and coffee houses that were popular in the 1800s. Who knows what they discussed or where their thoughts led when they sat, as I picture them, each in a high-backed leather chair, either side of an ornate fireplace, smoking a pipe and drinking tea? Whenever I heard this story, I imagined my Great, Great Grandfather, wearing top hat and tails perhaps, climbing the steps to Dickens’ house and raising the brass knocker to signal his arrival. I imagined them cosied up by a roaring fire in the winter, discussing the finer points of London affairs and swapping anecdotes, truly, gentlemen at leisure. How did they meet? With four years between them in age they could have gone to the same school at some point. They could have visited the same coffee houses, frequented the same drinking establishments. Perhaps Charles Dickens purchased jewellery for his wife from my Great, Great Grandfather. Perhaps John Faulder read some of the work in progress and gave comments. Or did Dickens keep that under wraps? Was their friendship based on a mutual interest far away from literature? Such questions are unlikely to be answered except by guesswork. I have a romanticised view of their friendship of course but then, perhaps it really was like that. Who is to say? Naturally, I would like to know if my own Great, Great Grandfather played any part in the stories that became so well known. Did he feature in any of them as a caricature or achieve a cameo role? It is well documented that Dickens did base his characters on the people he encountered. Given that the men’s friendship would have been cemented by their own similar family lives – John Faulder having eight children of his own, they may have had much in common. In Dickens’ wealthier times, he may have indeed visited my grandfather in his jewellery shop or did they meet when both were down on their luck? I feel slightly frustrated that I can no longer go to my Grandfather and ask more but even without any further information, I cannot help but wonder if John Faulder is mentioned somewhere, in the annals of literature, if not by name then by nature making him a vital cog in the workings of that great, literary mind! 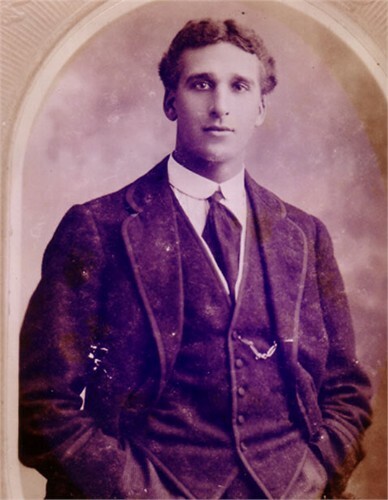 I have no photos of John Faulder to date but I do of my Grandfather – here is Victor Gordon Faulder, in the 1900s looking very suave! Fascinating! What a thought, GG and Dickens chewing the fat and slurping tea- What do you think ‘Builders’, or Earl Grey? Looking forward to reading your novel Debbie. Hi Bill and thank you. The novel is definitely ‘in progress’ constantly changing shape and direction. I hope to finish it by the summer but with dogs, children and grandchildren taking up my time, we can only wait and see! 🙂 Oh and I think – Earl Grey! I love to read Dicken’s and I enjoyed playing Oliver in the Musical during my high school days…. I also like good muckraking. My Great Uncle and Great Grandfather Apprenticed as Jewelers at the King’s Court in London. I have a lovely amethyst and pearl necklace in a shadow box on my buffet that was a prototype made for the royal court by my Great Uncle and then given to my Mother when she graduated from college – as my Great Uncle had no children. It is called “Doves of PEACE” I was disappointed not to be able to see the finished work when I visited London. I thought they could have made a video of all the jewels so I could have at least seen that. Queen Elizabeth’s father sent my Uncle to Saskatoon Saskatchewan to open a store as he thought that would be the center of Canada and the most important focal point. Patricia, your tale is equally as fascinating. I shall enjoy exploring and relating a few more choice ‘tenuous connections from the past in my next post! I’m placing a pre-order for Tea With Dickens. What did your great great grandfather and Charles Dickens talk about? It’s my guess that you couldn’t have a conversation for long without social reformism being a major topic of discussion. The man clearly had great empathy for the plight of the poor. Dickens stories have a resonance that will remain in the hearts of mankind for centuries to come. Thank you John, a pre-order will spur me on to the end! I am doing a great deal of family, as well social research for this novel I have to admit and have thus been distracted by other interesting gems that have presented themselves to me. Geneology is indeed an amazing subject and could well provide some thought provoking topics for this blog. Without putting you under too much pressure Deborah, it would be great to see your book out during this Dickens’ bicentennial year. There certainly seems to have sparked off a Dickens revival. There doesn’t seem to be a lot out there. I think you have an absolute winner there Deborah. Perhaps even TV/film rights. I’m very excited for you, its a very unique take on a great literary hero. What an amazing story! Your grandfather is quite handsome. I can hardly wait to read the story you tell about these tea dates. John – No pressure eh? Thanks for the encouragement, you have given me the push I need to get on with the novel – here’s to an end to procrastination! Deb – with John pushing to finish the novel and my promising to disclose further gems of tenuous literary links, I really must focus! What a fun premise to explore in a novel. And what a handsome grandfather! Truly dashing!